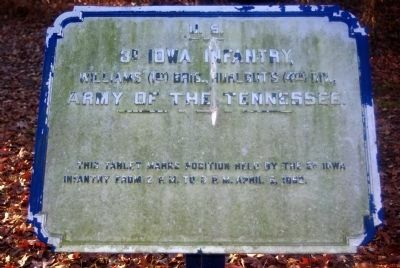 This tablet marks position held by the 3d Iowa infantry from 2 P.M. to 3 P.M. April 6, 1862. Location. 35° 7.958′ N, 88° 20.069′ W. Marker is in Shiloh, Tennessee, in Hardin County. 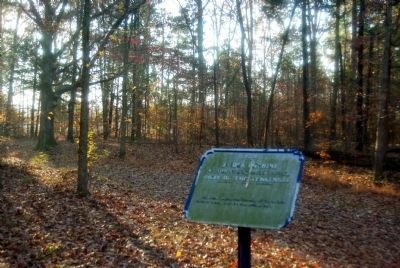 Marker is on Sunken Road 0.1 miles west of Hamburg-Savannah Road, on the left when traveling east. Touch for map. 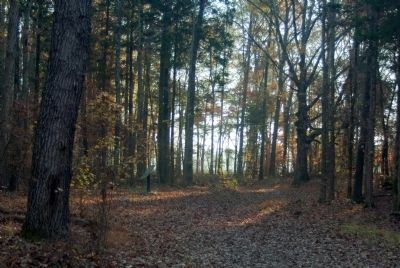 Tablet is on Sunken Road, an unpaved pedestrian-only route in Shiloh National Military Park. Marker is in this post office area: Shiloh TN 38376, United States of America. Touch for directions. Looking south in the direction from which the Confederate troops attacked. feet away); 31st Indiana Infantry (about 600 feet away); 61st Illinois Infantry (about 700 feet away); 25th Kentucky Infantry (about 700 feet away). Touch for a list and map of all markers in Shiloh. Looking east along the line of battle, the Sunken Road. More. Search the internet for 3rd Iowa Infantry. Credits. This page was last revised on June 16, 2016. This page originally submitted on November 22, 2010, by Allen Gathman of Pocahontas, Missouri. This page has been viewed 401 times since then and 5 times this year. Photos: 1, 2, 3. submitted on November 22, 2010, by Allen Gathman of Pocahontas, Missouri. • Craig Swain was the editor who published this page.